Damo and Vikki's Round the World Trip! 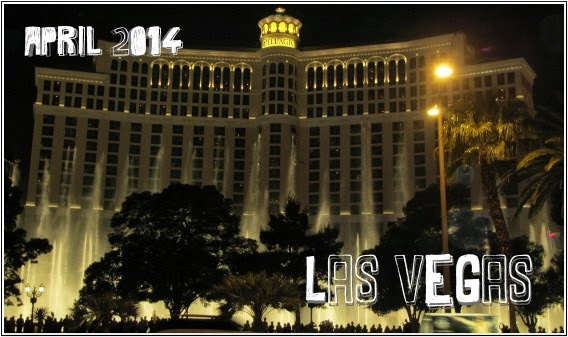 : Las Vegas Highlights! We flew with Virgin America from New York to Las Vegas, which I was so excited about as I’ve always wanted to go! We were due to take off at 9.35am but just as we were heading for the runway, a passenger was ill so we had to go back to get medical help for them. We then had to re-fuel (?!) then wait in a line of 20 planes to take off!! After about an hour we were finally good to go! We got to see the best safety video in the world, it’s all singing and dancing! I even somehow discovered that there was free wifi on the plane and was talking to my mum on Facebook while flying over Lake Michigan!! We stayed at Excalibur, which was awesome!! I had read a few not great reviews, and we’d got a pretty cheap deal, so I wasn’t expecting much but we were so surprised! We even got a room with a view of the strip. In the hotel was also a big food court, which we loved! Over the next couple of days we did a lot of laying by the pool in the day and exploring the strip and hotels when it got dark, as it was so much better at night! One of my favourite hotels was the Bellagio, it had a huge conservatory and gardens, glass sculptures on the ceiling in the lobby, and the world’s largest chocolate fountain! TIP: If you are planning on visiting Vegas anytime soon, there is a game on Facebook (yes I know Facebook games are a load of poo but hear me out!!!) called MyVegas. It’s just like playing slot machines but you gradually earn points which you can actually spend in Vegas! We only found out about it about 2 months before we went but we managed to get a free breakfast buffet each at our hotel and free entry into the Secret Garden at the Mirage hotel which has dolphins and amazing white tigers! If you can earn enough points though you can get free hotel rooms and free tickets to shows! Deffo worth it! We saw 3 shows in Vegas - Elton John, Boyz II Men and Cirque Du Soleil’s ‘ONE’ which is a Michael Jackson show! I had wanted to see Britney Spears and Celine Dion but they both seemed to have all of April off, dam it!!! For Elton John we bought the cheapest tickets, right on the back balcony, but the way the seating curves round in the Colusseum at Caesar’s Palace meant that you didn’t feel that far away. Not sure how much people paid right at the front, but the first few rows actually got to go on the stage with him! For Boyz II Men we had pretty good seats, a little bit to the side but only about 4 rows from the front. They were so good, and at one point they came out into the audience giving out roses to the women while they were singing! People started getting out of their seats and going into the aisle so I followed! I got to hug one of the guys and he was singing in my ear it was beautiful!!! The Cirque Du Soleil show was just AMAZING, the best show I’ve ever seen!!! I love Cirque Du Soleil anyway, but this was so different from their other shows as there was a lot more dancing, but still all the usual crazy acrobatics. Before the show started there were a group of cast members walking around the seats dressed like paparazzi in long coats (like in the Billie Jean music video). They walked past me then suddenly turned back and pounced on me flashing all their cameras in my face! I almost jumped out of my seat! I had managed to get a cold so that night I couldn’t get to sleep, and there were lots of noisy drunk people walking past the room. Then at 2.30am the fire alarm which is the loudest thing I’ve ever heard got set off by someone!! And when I say alarm, it was the most horrible alarm sound followed by a creepy recorded voice telling us to stay put while they find out what the problem was, over and over and over…! Eventually the creepy voice said it was all ok and no need to evacuate so we could actually get some sleep! Some of the other things we did in Vegas included going to watch the Blue Man Group pre-show parade in the Monte Carlo hotel which someone had told us about, riding the New York New York rollercoaster, which was fun but you can tell it’s old, it’s pretty bumpy! Walking around the Venetian and watching the people singing on the gondolas, visiting the Las Vegas sign! One night we walked past the Coyote Ugly bar which was doing free entry and buy 1 get 1 free drinks so we went in there for a bit, it was good in there and the cocktails I had were strong! We didn't really do much gambling, we had to be so careful with money as we had so much travelling ahead of us!! But Damo's dad said to put $10 on black so we did for him, won and went and collected $20 and left! At the airport we had to be weighed then got given stickers with the number of our helicopter on it, before quick safety briefing and getting in the helicopter! 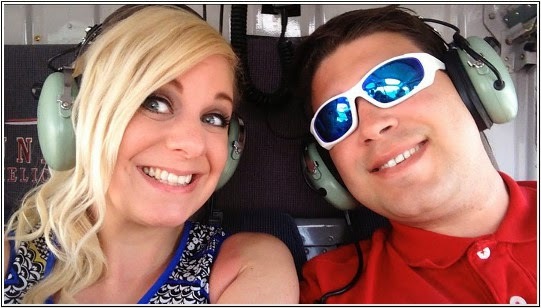 It was our first time in a helicopter so we were really excited! I had dosed myself up with travel sickness tablets as when our friend went she spent the whole way back with her head down thinking she was going to spew!! We got on board, got our ear phones on and we were off! On the way there we had a commentary in our ear phones telling us the places we were flying over and what we could see. I was finding it really interesting but the other 4 people on the trip with us wanted their’s in Spanish and the pilot couldn’t work out which buttons were which. Mine then started talking to me in Spanish and he couldn’t change it back! Grrr!!! Luckily Damo wasn’t bothered about listening to it anyway so I stole his ear phones! We flew over the Hoover Dam, Lake Mead and the Mojave Desert, then got to the west rim of the Grand Canyon and landed inside it. We then had 30 minutes to take photos, drink champers and eat a picnic! It went so quickly then we were back on the helicopter for the trip back. I got to sit in the front this time, and as we got back to Las Vegas the pilot took us over downtown and along the strip! That night we went up the Eiffel Tower which had amazing views, we also had amazing views of Lorde doing a concert on the rooftop of a hotel! We watched the Bellagio fountains from up there a couple of times as well. Definitely go up here if you visit Vegas!! then walked back to the hotel and I made myself feel really sick by drinking a huge ‘ICEE’ slush! On our last full day we got the bus up to the top of the strip and went to the ‘Pawn Stars’ shop (the shop from the TV show!) there was a huge queue to get in, I didn’t realise it was so popular! We went in and walked round taking a few pictures, then started chatting to a Canadian couple who said they were hanging around to see the actual stars of the show, I have no idea how often they are there but we weren’t waiting! We then got stuck talking to the couple, the woman could talk forever! She had some funny stories but it was just one of those moments where you couldn’t get away! Finally we managed to leave and decided we would walk to Stratosphere because it didn’t look that far BUT IT WAS! Had a little look round Stratosphere but didn’t go up it, got the bus down to Circus Circus and watched a lady doing aerial silks. Then got back on the bus back to the hotel to pack our cases and get everything ready for leaving for San Francisco the next day. Las Vegas was amazing and it’s definitely somewhere I’m sure we’ll visit again one day! !